March | 2014 | the wine snob. Let’s give the weirdos some love this week, y’all. 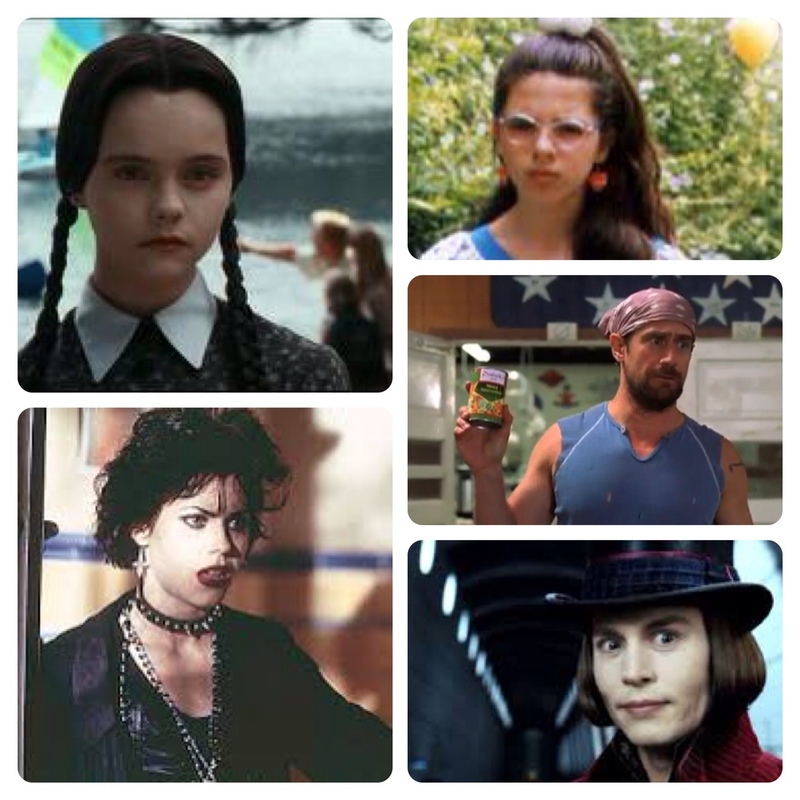 First of all, let’s have a round of applause for some of my favorite weird characters from various movies. If you don’t know who any of them are, I really pity you… Especially if you’ve never seen Wet Hot American Summer. So yes, this is a weird little grape. What’s weird about it? Well, definitely not the taste. Mostly the name. 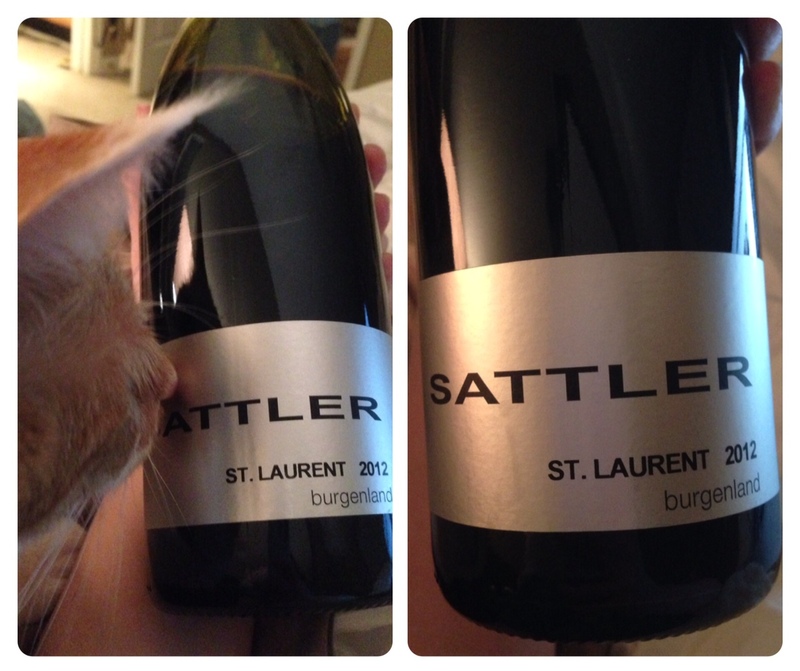 Yes, the St. Laurent is in fact the name of the grape! I can’t help but wonder, perhaps somewhat glibly, what they were thinking when they named the grape St. Laurent. From my not-terribly-extensive-Googling-okay-so-sue-me, the conclusion seems to be that it was named that after St. Lawrence Day, which is celebrated by Europeans (what a cheeky bunch they are!) on August 10th, which is when or around this grape usually ripens. The cat finds this bottle highly suspect. But maybe that’s just my American sensitivities that are confounded by the name of the grape. And I don’t dislike it, per say; I just think it’s odd. But, there’s a zillion grape names out there that are nothing if not odd: remember the Bukettraube? Vranec? Just to name a couple. 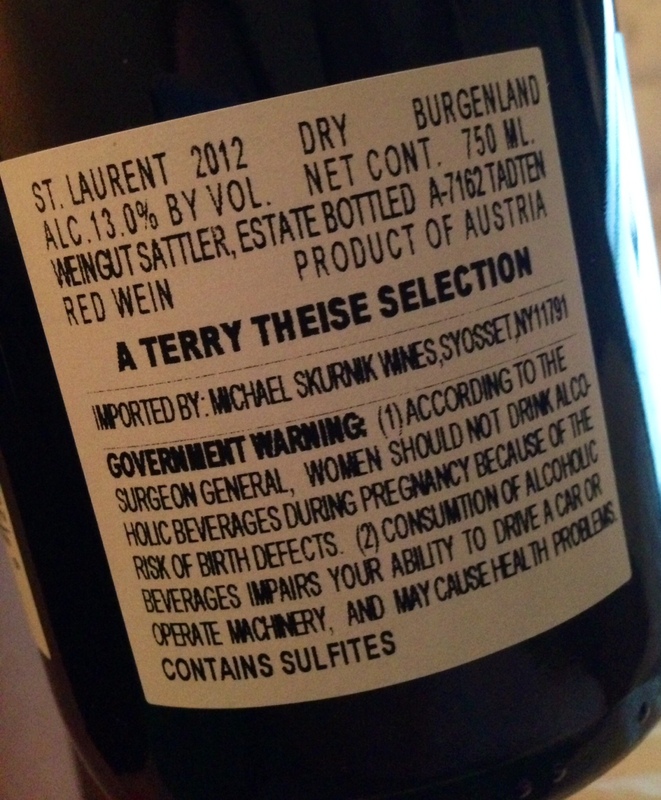 I found some really colorful ways to describe St. Laurent on the good old interwebs: Terry Theise calls it “Pinot Noir with a touch of ‘sauvage'” in one of his catalogues. John Schreiner says, “it comes across as a Pinot Noir wearing hiking boots.” (source is a great article found here). The Pinot Noir comparisons are no coincidence, as it IS actually genetically related to Pinot Noir. Here’s what I think: yes to both of those quotes. Suffice to say, I would definitely recommend this wine to people that are fond of Pinot Noir. It drinks like a old-world style Pinot, but with a bit more flesh on its bones. The skin on St. Laurent is darker, and the wine definitely reflects that. A deep, pretty shade of eggplanty-purple, the nose is generous and forthcoming. Notes of creamy vanilla swirl about after some initial blue fruits, black cherry, blackberry, violets, cherry cough drops, and a touch of evergreen. The palate is richer than it’s 13% alcohol reflects and uber-smooth. It finishes with a tang of red plums and redcurrants. Really tasty. St. Laurent is apparently one of the widest planted grapes in the Czech Republic and other parts of Eastern Europe. And there’s some in Canada and New Zealand, too. Are there any crazy wahoos in Oregon growing this grape? Inquiring minds want to know! It wouldn’t shock me, logistically, except that I don’t know much about what it takes to grow a new grape somewhere. Seems like that might be tricky. So give this one a try if you’re looking for a cool new discovery this week! You’ll find it at the wine sale this Saturday, March 22nd from 12-2, if you remain unconvinced of it’s merit. If nothing else, you can commit some of this to memory and show off to a friend or two the next time you’re in a wine store or a wine bar. Like… Cellar on Greene. Since you definitely will not find this wine as a glass pour anywhere else in Columbia. Yep, we excel at the strange on our corner of Greene Street. I should also mention that this wine sells for $17 a bottle! So try it! Get weird!